Marie Claire magazine has launched Marie Claire Edit – a shopping experience curated by their fashion editors. The e-commerce platform features brands including NET-A-PORTER, ASOS, Topshop, and many more. 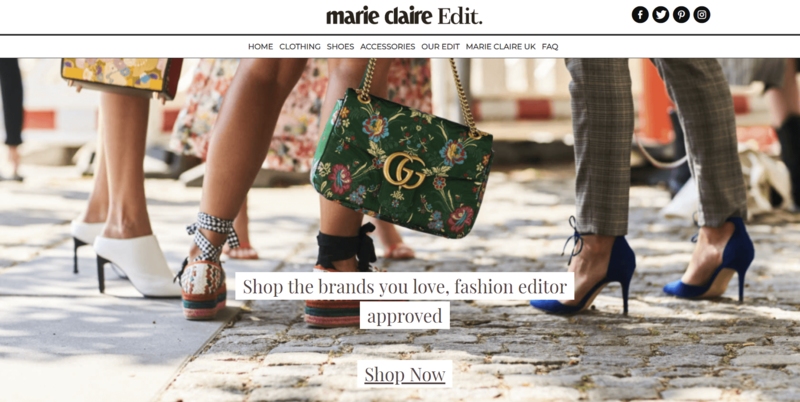 The idea of the site is to give Marie Claire readers a place to shop where all the items are current, on-trend and paired with pro styling tips. Products are pulled together in themes like, “The major knits to wear right now,” “These Christmas jumpers prove you can be festive AND chic” and “The checked blazer upgrades you’ll need this season.” So the editorial voice of Marie Claire remains, but the collections are lighter on text, with shopping truly the main focus. Marie Claire Edit also plans to work closely with designers. Their future vision includes housing exclusive interviews and major product launch news. As print magazines continue to look for new ways to stay relevant and profitable, Marie Claire is taking a big step in a new direction for publishers. Snapchat and Instagram, two popular social media platforms are entering the world of e-commerce. Both platforms point users in a shopping direction. Each of the apps increase their competition amongst each other as they battle to gain the most following. In today’s digital era, eCommerce is transforming the way we absorb information and online shop. For Snapchat, eCommerce is utilized as Snapchat presents the “Shoppable Snap Ads”. In this specific ad, Snapchat promotes Spectacles camera sunglasses. Meanwhile, Instagram utilizes shopping in its feature of “Instagram Stories”. With this feature, retail stores can promote their merchandise one user at a time. 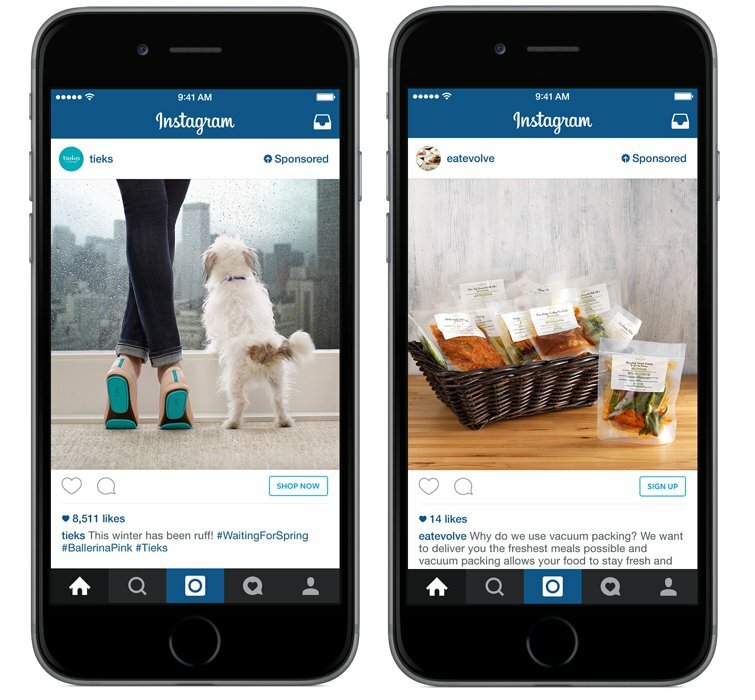 Brands are slowly beginning to take over each Instagram user’s feed and what they see. Snapchat like its competitor, has a feature in which users can stay in the know about their favorite brands and see how they can take action. Snapchat additionally utilizes eCommerce to promote Dunkin’ Donuts. As America runs on Dunkin (no pun intended), it allows for users to interact with the brand by playing a virtual reality game, designed as an ad. 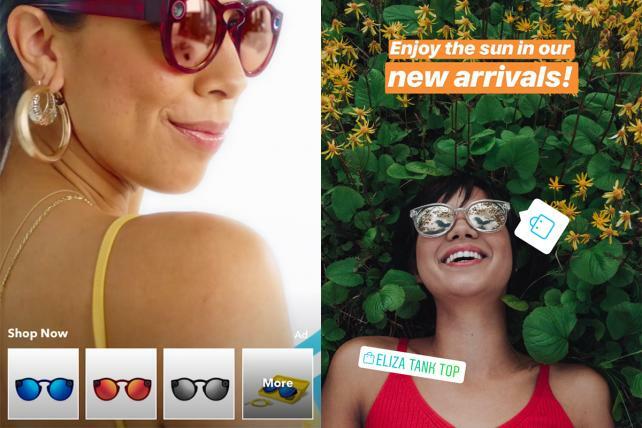 Snapchat additionally includes “carousel-style” shopping ads, where users can interact with different filters for their favorite brands and send to their friends. eCommerce remains to be a hot topic in today’s ad world. eCommerce is a major influence to how agencies and brands engage with their clients and users. 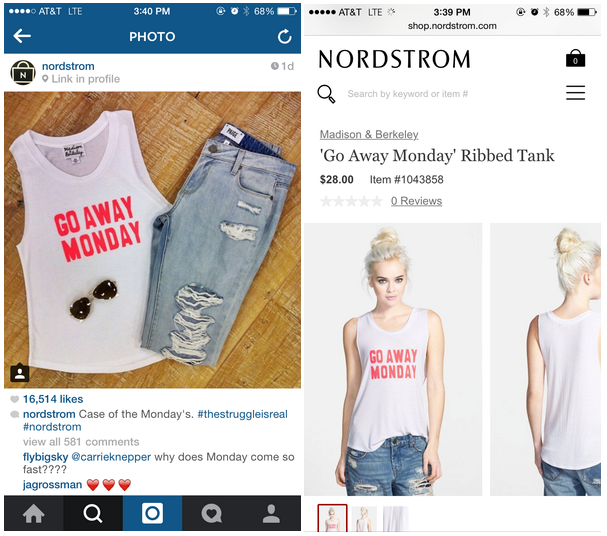 The social media platforms, like Instagram and Snapchat use eCommerce to their advantage. 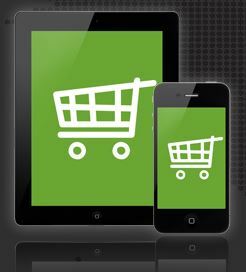 With fun and eye-catching ads, eCommerce helps increase brand awareness and grow meaningful relationships with clients. As a global customer relationship agency, MRM//McCann works to use eCommerce as a specific tool in which clients can successfully and effectively interact with their users. Walmart’s tech incubator is out with its first experiment. The incubator, known as Store No. 8, just launched Jetblack, a concierge-style service for requesting stuff and getting it really quickly. To shop with Jetblack, first you need an invite. Right now the service is limited to some customers in Manhattan and Brooklyn who are part of an eight-month pilot program restricted to buildings with a doorman, though that will soon expand and a waitlist is available now. The service is $50 a month — considerably less than some adjacent competitors, while considerably more than Amazon Prime — and promises same-day delivery. Jetblack is focusing on “time-strapped urban parents” seeking “more efficient ways to shop for themselves and their families.” To request something, Jetblack members send a text message and will receive product recommendations sent back in text. Those recommendations are culled from Walmart and Jet.com but also from specialty retailers locally. That means any product request is fair game and “sourcing a specific beauty cream from a member’s favorite local boutique, curating custom Easter baskets and delivering them once the kids are asleep and rushing beach essentials to a family on vacation” are all within the realm of Jetblack fulfillments. “Consumers are looking for more efficient ways to shop for themselves and their families without having to compromise on product quality,” said Jetblack co-founder and CEO Jenny Fleiss, formerly of Rent the Runway. In retail and e-commerce, competition is hot around convenience. The pilot is interesting because (1) New Yorkers have opposed Walmart retail spaces in the past and (2) New Yorkers are already getting the best of same-day shipping/delivery in so many areas — so they expect it/are used to it — so they need it, but will they care about Walmart’s offering? Shop for Leggings… While Hiking? During SXSW, Outdoor Voices rolled out a new AR app, which encouraged festival-goers to break away from the craziness of the convention center and explore the hiking trails around Austin… and, use their app. The app is directed users to a park where they could then scan the ground and be rewarded with location-specific deals on apparel; the items were viewable in AR and users could see them in nature, explore them in detail, and even order using Apple Pay. Why it’s hot: While some brands have started experimenting with AR games and scavenger hunts, Outdoor Voices takes an in interesting attempt to combine with commerce. Why it kind of defeats the purpose of ‘getting outdoors’ and ‘unplugging’, what better way to buy outdoor hiking clothes – while you’re doing that exact thing? Details are a bit scant, but eBay announced this week it will soon be integrating AR functionality into its app. While not the newest kid on the block (eg, Ikea has used AR for years), eBay is a massive marketplace where millions of people globally buy and sell things. With physical retail integrating technology to fight back against the convenience of e-commerce, this is an example of e-commerce trying to bring elements of physical retail to the digital world. One of the big disadvantages of e-commerce is usually you’ll only see a bunch of images of a product, which in eBay’s case may or may not be of the actual product you’re buying. The ability to see what something looks like in a virtual 3 dimensions is a major new advantage. Also to note this week – eBay hired former Twitter data scientist Jan Pedersen to lead its AI efforts. General Motors is launching a new in-vehicle app named Marketplace that will allow drivers to pay for goods such as gasoline or coffee and schedule service through their infotainment systems. The automaker expects the free technology, which it is calling an industry first, to quickly expand from about a dozen offerings, such as ordering Dunkin’ Donuts or reserving a table at TGI Fridays, to other services such as Starbucks orders and dealership services, including oil changes. “We are using it also to improve how our customers interact with the vehicle and the dealership network,” says Santiago Chamorro, GM vice president of global connected customer experience. He emphasized the connections are secure, and Marketplace is not meant to be an in-vehicle digital billboard. In-vehicle marketplaces and app-based services have been discussed for years. Offerings such as Apple CarPlay and Android Auto mirror smartphone apps onto the vehicle’s infotainment screens but do not complete financial transactions. Some services such as ordering Dunkin’ Donuts for pick up require drivers to have an account or profile with the store. Marketplace uses recent and favorite foods and settings from the profiles to customize the offerings for the driver. Deals and membership rewards are currently available from gas stations. Paying for gasoline is expected to be available early next year. Dealership services such as scheduling oil changes or other maintenance are expected to be added as early as next year. 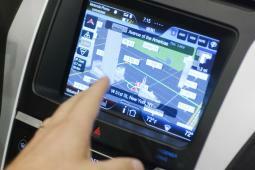 Vehicles will have the capability to alert drivers of needed services and schedule them, if the driver would like. Other current partners with Marketplace include Wingstop, Shell, ExxonMobil, Priceline.com, Parkopedia, Applebee’s, IHOP and Delivery.com. Starbucks is expected to be added in early 2018. Automotive innovation is not only about self-driving technology, but about retail and the new consumer expectations brands need to meet. The opportunity for e-commerce to be at your fingertips even while driving may open up more geo-fenced, trackable marketing opportunities. 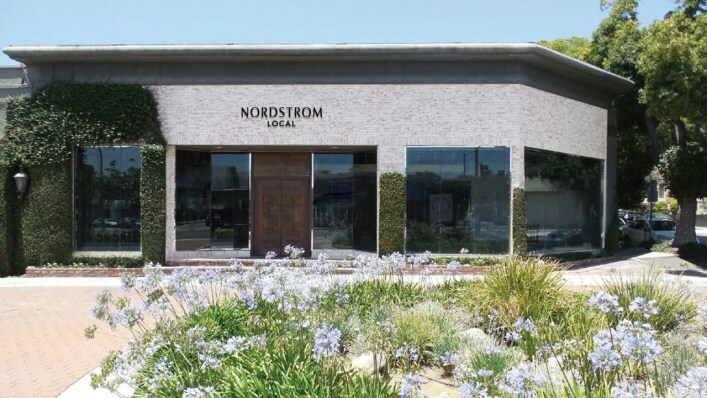 Faced with diminishing profits in their brick-and-mortar business (along with the entire retail industry), Nordstrom announced a new, forward-thinking venture: Nordstrom Local, tiny stores with no inventory. This may seem counterintuitive, given Nordstrom’s historical dominance in the large-scale department store category, but the experimental stores are drawing on several key elements of recent commerce (and, specifically, e-commerce) successes like Warby Parker and Bonobos. First, the stores are pivoting to a fully e-commerce process for purchasing items. These tiny stores will be outfitted (no pun intended) with devices that will allow customers to place orders for anything in the Nordstrom universe, and the stores will act as access points for customers wishing to pick up online orders and return items. Second, the stores are also focusing on the brand experience, not the available inventory, as the core value-add of the physical location. Nordstrom Local stores will offer premium services such as personal stylists, wine, and manicures as a way to reframe the in-store experience as one of luxury, pampering, catered attention, etc. Why it’s hot: With the retail industry in free-fall, retailers desperately need to innovate in order to survive, and these small-scale stores just might be the trick. Nordstrom isn’t the only one to try this approach – Sephora recently launched a similar small-scale store in Boston – but they’re certainly one of the largest. If their Local stores succeed, it may prove a path forward for other struggling retailers. 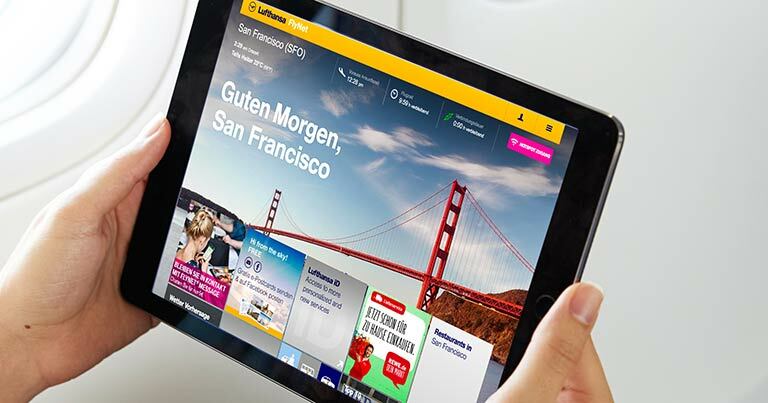 German airline Lufthansa has partnered with an online supermarket so passengers can shop for groceries on their flight home and avoid returning to an empty fridge. The trial began on 1 October and will run until 1 December. For the first six weeks of the trial, the service will be available on long-haul flights to Düsseldorf, Frankfurt and Munich. In the second six weeks, the service will be available on long-haul flights that have those three cities as the final destination. From plane to home at just the right moment. Not only they deliver to your home but you can choose the exact time you want it to be delivered to your address. Campaign may be to furniture what Casper is to mattresses. Finally you can get the previously mythical combination of quality furniture that is shippable using normal delivery methods, and that requires minimal assembly. It’s also billed as being “built for life”, with prices on par with Crate and Barrel, or West Elm, and ships for “free”. Great products are designed around removing pain points from the customer experience. The long transit times (and coordinating final delivery) that can come with freight shipping (+the cost), and the overly frustrating and laborious assembly required with other furniture purchased digitally are two major headaches when buying furniture online. Campaign solves for both. Meanwhile, IKEA is still trying to figure out how to make a flat-packable couch. This past week the internet was abuzz with news of CPG startup Brandless. Headed by serial entrepreneurs Tina Sharkey and Ido Leffler, Brandless is selling consumer staples like food and healthcare direct to consumers all priced at $3. “It felt like modern consumption was really broken,” says cofounder and CEO Tina Sharkey. Millennial consumers don’t want to buy their parents’ brands, she argues, and all brands are too expensive, marked up to cover the costs of distribution, warehousing and retail space. By eliminating what she refers to as this “brand tax,” she figured that Brandless could slash the costs of basic packaged consumer goods that people buy regularly, and potentially become a significant player in a $2 trillion market dominated by the likes of P&G and General Mills. But the biggest difference between Brandless and all the major CPG players is its business model: Rather than sell through traditional retail stores, the company is only offering its goods online. By doing so, the company will have what few of the CPG giants have – a direct relationship with the consumers of its products. It plans to exploit this relationship through a heavy investment in data and by building a sense of community through memberships and philanthropy (with every purchase, the company will donate to Feeding America). Move over Warby Parker, Casper and the rest. You’re not the only ones willing to take on the big boys. And rather than relying on product brands, there’s just one brand in this game to promote – and it’s Brandless. Just beneath the placid surface of a typical product page on Amazon lies an unseen world, a system where third-party vendors can sell products alongside Amazon’s own goods. It’s like a stock market, complete with day traders, code-slinging quants, artificial intelligence algorithms and, yes, flash crashes. It’s clear, after talking to sellers and the software companies that empower them, that the biggest of these vendors are growing into sophisticated retailers in their own right. The top few hundred use pricing algorithms to battle with one another for the coveted “Buy Box,” which designates the default seller of an item. It’s the Amazon equivalent of a No. 1 ranking on Google search, and a tremendous driver of sales. Getting under the hood of how retail monster Amazon operates is always fascinating. The idea that prices are updating hundreds of thousands of times a day is nuts. 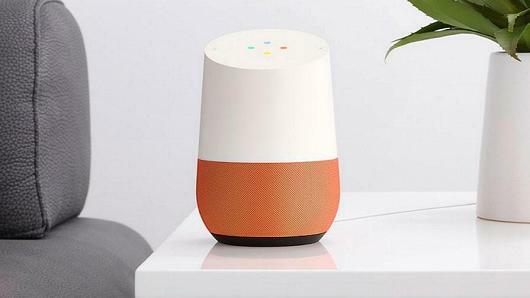 Google Home is about to offer a feature Amazon’s Alexa can’t match: finds from local stores. The new feature is powered by local inventory feeds sent by retailers that buy ads on Google. In the past year, local shopping queries have increased 45 percent and the search giant has doubled the number of retailers that send local inventory feeds. With this new feature, Google is offering users something Amazon doesn’t — a way to find merchandise at your local store and try before you buy. It’s all part of Google’s long-term strategy to develop products and services that use artificial intelligence to make it easier for people to interact with computers – that, in turn, will feed into Google’s ad-based business model. But in 2016, Daiju sold 1.8 billion yuan ($26.2 million) worth of acting and dance costumes. “Made in China” is nothing new. But the internet and e-Commerce specifically have exponentially increased the volume and reach of manufacturing, changing the face of the country. Half of Daiji’s 45,000 residents now produce or sell costumes—ranging from movie-villain attire to cute versions of snakes, alligators, and monkeys on Alibaba-owned Taobao. 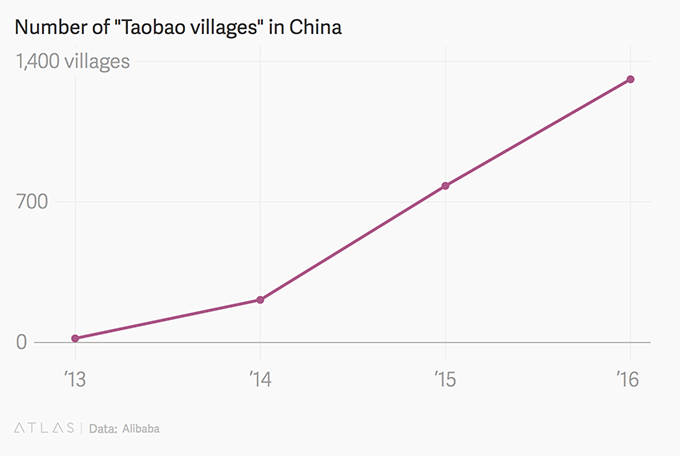 And Daiji is not the only rural town in China dramatically changed by globalization. In November 2016, China’s State Council Office on Poverty Alleviation, along with 16 other ministries, released guidelines calling for a massive expansion of e-commerce in rural areas as part of the fight against poverty. In the current political environment where countries like the U.S., the U.K. and France are looking for ways to preserve jobs of old, looking at countries that continually push to capitalize on globalization may help us to embrace change rather than hide from it. 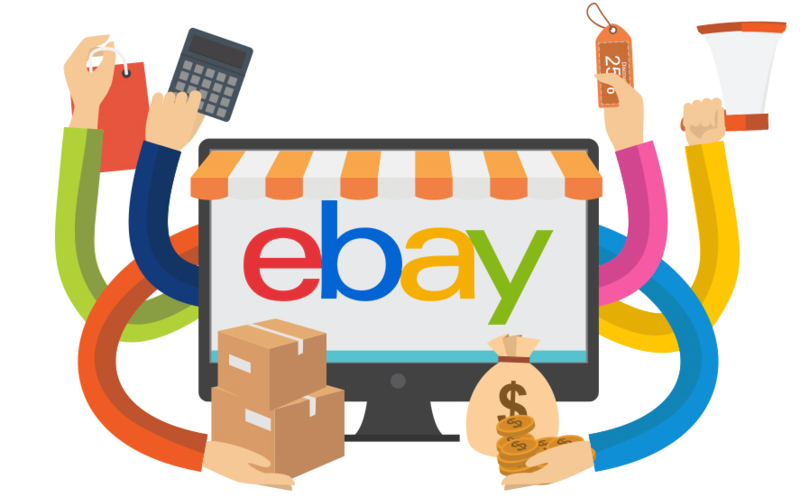 ebay tried to cure some holiday woes in the US this year by instituting a “Boxing Weekend,” playing on a long tradition of Boxing Day in a number of other countries. The brand used a cultural moment of excess or unwanted gifts as an excuse to use ebay as well as their ebay Valet service. The promotion let sellers use ebay Valet for free, and offered a number of drop-off points in Westfield malls across the country during the post-Christmas weekend. This promotion does a number of things well, especially a contextual integration of physical and digital services with the drop-off stations in malls. It’s also interesting to note Westfield’s willingness to play with the secondary market ebay creates in the context of their own spaces, where brands are already competing for attention and revenue. Worth noting as well is that ebay partnered with The Onion Labs for the video promoting the Boxing Weekend extension of their #wishbigger campaign. Fun stuff. Most cars sold today lack the technology for drivers to pay for items they purchase (unless they use a smartphone). But by 2022, 82.5 million autos worldwide will be connected to the internet, more than triple the number now, according to researcher IHS Automotive. In the next two to five years, “buy buttons” connected to smartphone mobile wallets will start appearing on dashboards, according to Richard Crone, who runs payment adviser Crone Consulting. That means motorists will soon be able to buy a pizza, fill up the tank or preorder a half caf skinny macchiato from Starbucks without pulling out their phone. Banks and credit card companies are looking to pile in. Visa has developed an app for the dashboard or smartphone that enables the car to automatically purchase gasoline, parking and fast food. But automakers this summer have proven easy targets for hackers as we mentioned in previous Hot Sauce posts here and here. This new technology will create more opportunities for brands to connect with their customers at the right moment (e.g. alter drivers of deals at Dunkin Donuts when they are driving near a location) while also providing overall convenience to consumers. Unfortunately there are also concerns that this will also create opportunities for hackers to steal credit card numbers, and other personal information that could lead to identify theft. According to Techcrunch, Apple.com removed the separate Store tab and integrated the shopping button with product information. They’ve also integrated more editorial-like features like the Accessories page. Why It’s Hot: The industry opinion seems to be that the redesign was motivated by mobile experiences. Aesthetically, the site went through a small change, but it feels relatively huge for the retailer, not just in design, but in narrative. The initial website spoke to a focus on the product, and the redesign speaks to a shopping experience. It’s interesting that a big retailer like Apple is finally evolving to a more obvious mobile-friendly design, but it also feels like the end of a product-obsessed Steve Jobs era. Instagram is going to begin including function buttons in their paid ad posts. In the caption of the brand image, there will be a “buy now” button for online retailers, an “Install now” button for mobile apps and a “Sign up” button for membership apps. The buttons will open in an in-app browser to keep the user in Instagram at all times, making it a more seamless process. These new interactive ads will incorporate Facebook data, which should allow more small businesses to begin advertising on Instagram, since they will be able to purchase smaller ad buys that target a narrower group of people. In addition to CTA buttons, Instagram has also added enhanced paid advertising targeting capabilities that very closely mirror those of Facebook. These enhanced capabilities allow advertisers to target their ads based on user interests in addition to age, gender and location. The buttons will roll out gradually, beginning with testing in Spain this week. Pinterest introduced a new way for retailers to sell products on its service as the platform has finally debuted its long-awaited buy button. 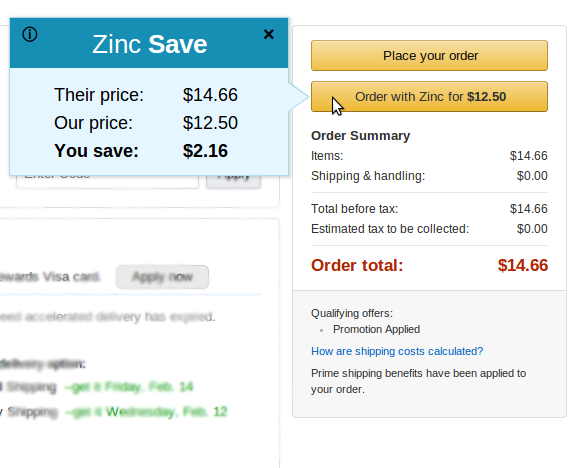 Users can shop on the site by clicking on “pinned” products to see the price, choose a color, size, and quantity. Visitors can then click on a buy button to complete the transaction using a credit card or by paying with Apple Pay through their iPhones. The new “buyable pins,” introduced Tuesday at an event at Pinterest’s San Francisco office, are a big step by the company to become more of a shopping hub. 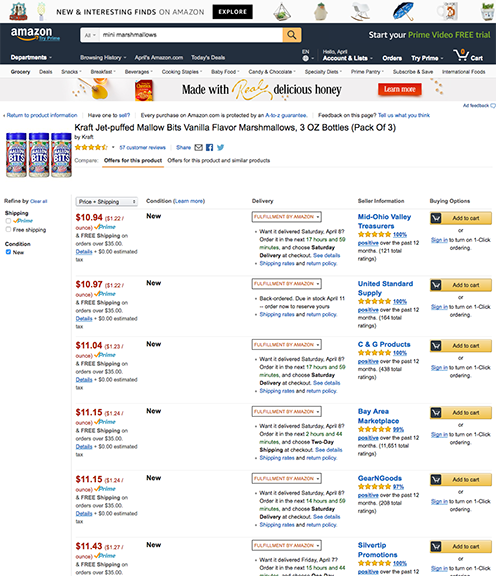 Millions of people already use the site to check out products that others recommend. Pinterest says U.S. iPhone and iPad users will start seeing the buy button in late June on millions of items from retailers such as Neiman Marcus, Kate Spade, Michael’s craft store, Nordstrom, Cole Hahn, and Macy’s. Shoppers pay no additional fees to buy items on Pinterest. Additionally, merchants pay no commission to sell. It’s unclear how Pinterest will make money from buyable pins. But it could be trying to gain traction with retailers before starting to charge them fees. Driving ecommerce is the holy grail of social marketing. According to new research from Millward Brown, 93% of active Pinners said they use Pinterest to plan purchases and 87% said they’ve bought something because of Pinterest. The ability to shop directly from Pinterest is particularly powerful because of the rise of mobile devices. Around 80% of users access Pinterest through a mobile device, which, because of their small screen size, make it inconvenient to click through to another site to complete a transaction. Pinterest, which investors have valued at $10 billion, still needs to prove that it can bring in the kind of revenue that other social media companies like Facebook and Twitter have been able to generate. Only recently has it really started to focus on making money. Send erasing pictures to your friends, pay through us, read our curated content and now shop. Snapchat is looking to grow, grow and grow. Most recently, Snapchat reportedly invested an undisclosed amount of money into Spring, a clothing retail-like app. The app allows you to “follow” brands you like, provides inspirational recommendations based on your preferences and enables users to purchase within the app. Spring is already available for iOS and Andriod but is still in the process of raising more money. Social media platforms these days are literally trying to do it all. The fact that this Snapchat is now tapping into ecommerce could be just the beginning of many more endeavors for the startup. Amazon’s newest tool, is a small tab that can be attached to a wall or appliance to ensure you never run out of the daily supplies that keep your life running smoothly. The Amazon Dash Button connects via Bluetooth to an app on your phone. When you notice you’re running low on the brand depicted on your Dash Button, you press it. Dash signals your phone, which connects to Amazon and orders a new supply shipped to your house. Users can use the app to monitor, change or cancel orders in real time, or just to keep track of their stock supplies at home. Initial reception of the Amazon Dash has been mixed: remote-control consumerism at this level does feel like a not-so-gentle satire of some aspect of American culture. Since consumer experience reports have yet to see the light of day, only time will tell how successful the Dash will be. Online retailers are always trying to squeeze revenue out of every Facebook status, tweet and Instagram they post, but it’s the photo-sharing social network that’s presented the greatest challenge. More and more retailers are either adopting third-party solutions or launching their own platforms to monetize their images. For some, that means creating an Instagram-like catalog. Others are turning Instagram likes into personalized emails. 1) NORDSTROM: Has partnered with Like2Buy for the past few years, leading customers via profile links on Instagram to brand pages or categories (like “jeans”). Target is another one of Like2Buy’s early adopters, but the big-box retailer frequently falters when it comes to connecting customers to the products they want. 2) MICHAEL KORS: Michael Kors (3.6 million followers) entered the shoppable Instagram game by sidestepping a third-party solution. The designer brand launched #InstaKors in November, a registration-based email subscription that responds to Instagram followers’ “likes” by sending out emails containing the product details from any Michael Kors images they favorite. 3) NIKEWOMEN: Nike Women (@nikewomen, 1.6 million followers) rolled out a shoppable Instagram store on the Nike website last week, and its easy-to-use platform might be one of the best social commerce experiences yet. 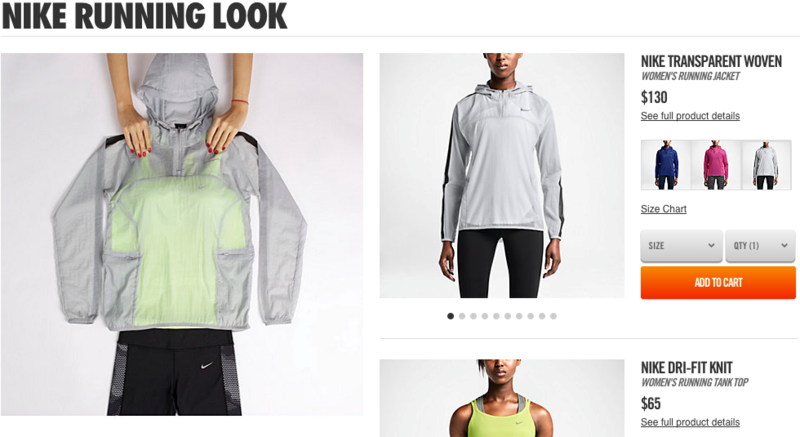 Similar to Like2Buy, Nike Women provides a link to its shoppable feed in their account bio. The link takes followers to Nike’s website, where the Instagram feed is replicated. Click on the images to shop the looks, and each item pictured is gathered into one product page where you can choose sizes and add whatever you want to buy from the Instagram to your cart, all on one page. The user experience is clean, and finding the actual item that’s sought after is – for once – guaranteed. But Gupta warned against sitting out the shoppable trend. This week Facebook is introducing Product Ads – a new format to help a business showcase their products. With product ads, you can advertise your product catalog on Facebook, either by manually creating campaigns targeting particular products to specific audiences or by uploading a product feed and letting Facebook dynamically serve relevant products to people browsing your website or app. Leading up to its official launch, Facebook has been testing Product Ads with a number of brand partners, including Target and Shutterfly. Product ads help direct response advertisers showcase more of their product inventory to drive higher click through rates and lower cost-to-actions. This solution consists of two ad types — multi-product ads and dynamic product ads. 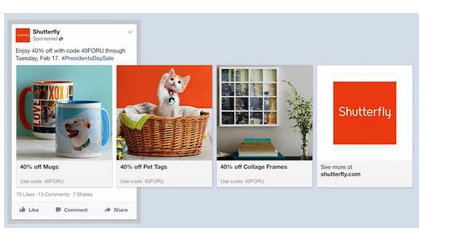 Multi-product ads showcase multiple images and links in News Feed. Each ad has a unique URL to drive traffic to different pages on the retailer’s site. With dynamic product ads, you can upload your entire product catalog and let Facebook serve timely and relevant creative across any device. Businesses can target users who have previously visited their site or app, as well as reaching people based on specific interests and geographies. Brands can also curate their offerings in a number of ways, like highlighting products that were most recently viewed by shoppers, or those products that are already selling well. The automated system will turn off ads for specific products when they are out of stock. Facebook has steadily been making inroads into ecommerce. 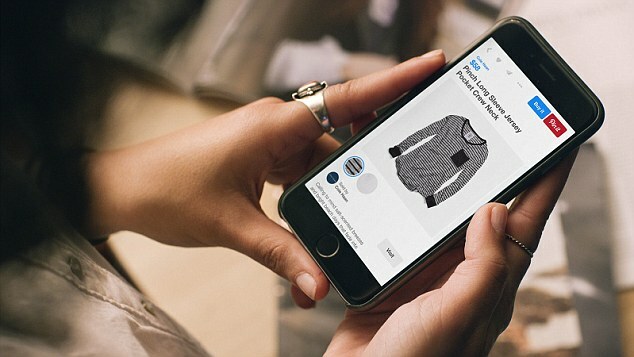 With the help of payment start-up Stripe, the social giant recently unveiled a “Buy” button, and expanded its classifieds-style ecommerce efforts. So far, social media has yet to carve out a significant share of the ecommerce market. Social media channels — including Facebook, Twitter, Instagram, and Pinterest — contributed just 1.7% of total e-commerce sales, this year, research firm Custora recently reported. By comparison, email contributed 27.3% of total online sales, followed by 18.9% originating from free search, and 18.5% from paid-search marketing. Advertising on the largest social media network is a must, but how will users respond? It will be interesting to see what the click through rates and sales from the ads will be. One of the more prolific VCs in Europe with close ties to e-commerce startup factory Rocket Internet has closed another fund — its biggest yet — to back more consumer internet businesses in the region and beyond, with an emphasis on e-commerce. Holtzbrinck Ventureshas raised €285 million ($331 million) for HV Holtzbrinck Ventures Fund VI, which will be used for early, middle, and late-stage investments, ranging from around $500,000 to $50 million per round. “The new fund is larger than the previous ones and will allow us to deploy more capital across the lifespan of a startup,” a spokesperson tells me. We’re in a heady period for venture investment at the moment. Dow Jones VentureSourcethis week released figures that noted 2014 VC investments totalled more than $52 billion, up 47% compared to 2013. That’s partly fuelled by unicorn-sized rounds for the likes of Uber and other late-stage companies, but also the bigger, ongoing surge we’ve been seeing for a while now around the wider field of tech startups and the search for the next big tech phenomenon, or at least bright exits of interesting companies to existing juggernauts. Holtzbrinck Ventures is tapping into that. It says this fund was not only its biggest yet, but it closed in less than four months and was oversubscribed. HV — which first opened for business in 2000 as the investment arm of the German media and publishing group but went independent in 2010 — has also been one of the firms leading the VC charge in the tech world. As an investor in Rocket Internet, the firm has piggy-backed on a lot of the Berlin-based incubators’ prolific e-commerce startup creation in Europe and emerging markets. HV has also upped the ante by directly putting in more money to fuel the aggressive expansion/funding that has helped some of the more sticky of these grow, with stakes in e-commerce marketplace Lazada, HelloFresh (food delivery), Paymill (Stripe clone) and Payleven (think Square) among them. It’s also funded e-commerce startups that are not Rocket Internet-created by share some DNA by way of founders and employees. Those have includedQuandoo, an OpenTable competitor. While Holtzbrinck has been active in emerging markets (on its own and alongside Rocket), it remains bullish on investing in European companies too. “it’s still possible to build relevant startups in Europe for e-commerce,” the spokesperson says, “maybe not in categories with proven business models but in new areas.” As one example, he cites FlixBus, which was launched only a couple of weeks ago that is backed by HV and General Atlantic. Like RedBus in India, the company is tackling the antiquated bus and coach industry, by letting users access schedules and buy tickets online. E-Commerce has been something invested in by many and a money shift this large just validates the future. Startups coming up in this industry means more innovative and creative competition and something we can have our pulse on or potential embrace if it can benefit the company. Whit Hiler, the creative behind the idea, is hosting the concept app on his website Kentucky for Kentucky, which celebrates anything related to the state. Soon Shopify, a retail app store, will sell the app for $10 a month where other retailers can purchase and use it. The idea of Paying it Forward is typically seen in brick and mortar stores like Starbucks or Dunkin’ Donuts where those who want to make a stranger smile may buy a cup of coffee for the person behind them in line. This app concept a new innovative idea that takes it a step further and puts it online. It reminded me a little of what Amazon has been doing for nonprofits with http://smile.amazon.com/ that donates 5% of your purchase to your chosen charity. 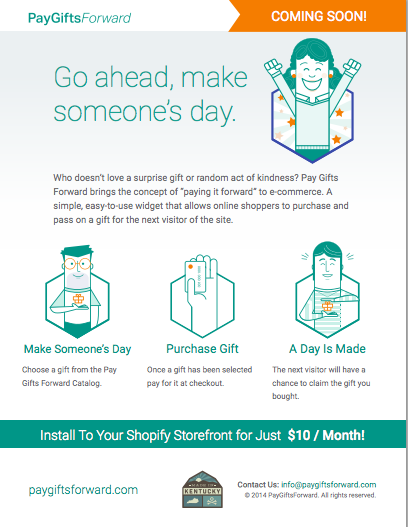 While this is giving a product to a stranger, I really like the idea of fusing doing good with e-commerce in this way. It’s a great upsell for companies to increase their online revenue while making consumers feel that they’re doing good. E-commerce services provider Digital River Inc said on Thursday it entered into an agreement to be acquired by an investor group led by Siris Capital Group LLC for about $840 million. The deal, valued at $26 per share in cash, is at a premium of almost 50 percent of Digital River’s Thursday’s closing price. The agreement, approved by the board of Minnesota-based Digital River, includes a 45-day “go-shop” period during which the company can solicit alternative proposals, Digital River said on Thursday. Siris will finance the deal with a combination of equity and debt, for which it has secured financing. The companies expect the deal to close in the first quarter of 2015. There can be a lot to learn for what the future is for the adoption of technology and behaviors when looking at the movement of money. Companies don’t invest $840 million unless they truly believe this is the future of commerce. Is there something for us, as the people that have the ability to implement this, to learn from these moves? Can we use this as a sign to be even more proactive in implementing into future plans? To help promote and introduce the PS 2014 Collection the Russian division of IKEA decided to up the ante by creating a website within the Instagram app itself. The ikea ps 2014 account resembles a beautiful and functional online IKEA catalog. The experience is divided into hero images of Tables, Chairs, Textiles, Light, Ideas, Storage, and Benches, that act as navigation categories. Clicking through the image categories will result in beautiful imagery featuring product information, pricing, and additional photos, much like a typical landing page. It is a great way to use a tool that the target market is familiar with in way that experiments with how the actual platform is meant to be used. Turning what is normally a one-off photo sharing application into a organized and useful site. Studies says those who view an item for sale on Instagram are 7x more likely to buy than the average consumer. To nudge consumers to purchase, more and more brands use services to curate Instagram photos and feature them throughout their e-commerce pages. Another service, however, LiketoKnow.It forges an even more direct link to commerce by letting consumers buy items directly from Instagram with a tap. If a post is tagged #Liketkit, those who like it and have signed up for the service will receive an email with a link to purchase. Vogue was one of the first to embrace the trend with a #tbt photo of Kate Moss in bikini (Liking would send LiketoKnow.It subscribers an email with similar items) and pieces of the Steven Alan collection. 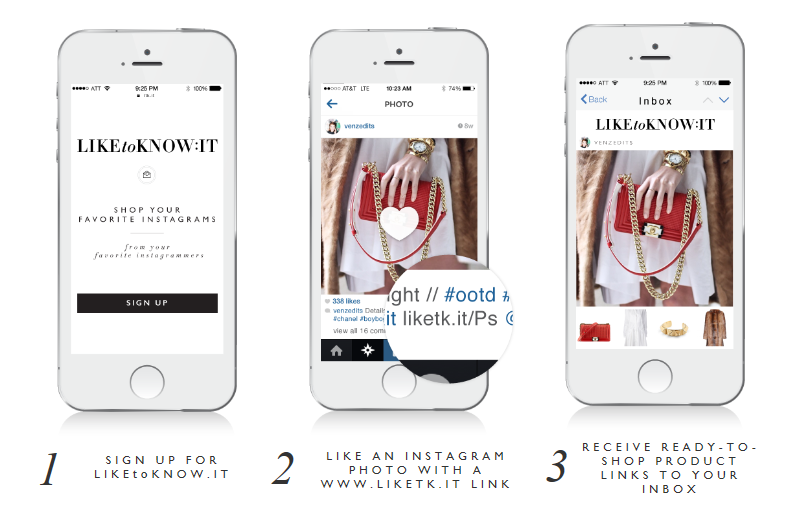 Bloggers such as Anh of 9to5chic have used LiketoKnow.It to promote items from their partners. Similar to #AmazonCart, Instagram is the latest social platform that marketers are trying to leverage to prove social ROI. As engagement continues to grow on the platform (15x that of Facebook per a recent Forrester report), we can expect to see more services promising to create a more direct link from views to purchase. Following a cryptic tweet from the company’s official Twitter account on June 4, sources are now reporting that Amazon will unveil a new smartphone device on June 18th. If true, the new device would pit Amazon against Apple in yet another high-growth tech category. “The companies are increasingly going head-to-head in devices such as tablets and in Web services including online entertainment, as they strive to be digital gateways to consumers. Mobile is central to that effort as more people carry gadgets and do their computing on the go,” cites Bloomberg Businessweek. The smartphone category, while dominated by large players like Apple and Samsung, remains an area of high-growth, particularly in global markets. So what would this device do to differentiate itself? Amazon is looking to continue expanding its brand as a true “technology company” that is far bigger than the ecommerce heritage that built the company. But the move is more than brand-building. Analysts suggest that Amazon will use a low/moderate priced, high performance device to drive more revenue to Amazon’s other channels and raise the entire boat as a whole. This continues the trend we’ve seen towards the device as a bridge to other services, rather than the intended revenue-driver itself. 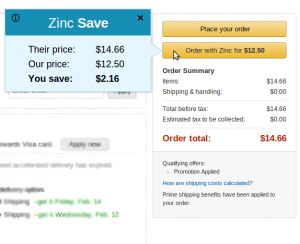 Zinc Save is a browser extension for Chrome compatible with major retailers like Macy’s, Target, Walmart, and Amazon that bills itself as a moneysaving utility, but it also turns these companies into into Bitcoin-friendly retailers. Like just about everything on the internet, merchants of all kinds are being challenged to think more collaboratively, more cooperatively and more realistically about the value of what they are offering customers online. Bitcoin is shaking up the online marketplace and reminding us that everything we do must have real, demonstrable value and that innovations in pricing is here to stay.